This part of Cornwall has a strong Methodist traditional and in 1850 Wesleyans built a preaching pit inspired by the Gwennap Pit where John Wesley had preached many sermons some 80 years earlier. 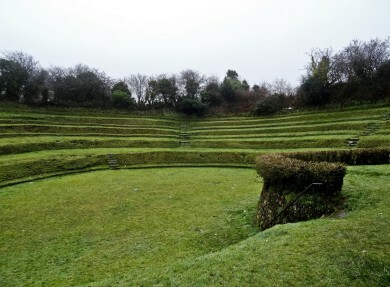 The amphitheatre was constructed on top of disused open mine workings but had a relatively short life as a Victorian open-air church. Within ten years other church groups and non-religious organisations – including the Indian Queens Band – were using it. Eventually Indian Queens Pit became overgrown and unloved and by the 1970s was out of favour. In 1976 a group of local enthusiasts started to restore the pit and it reopened in 1978. It’s now a Scheduled Monument, which recognises its cultural and historical importance. A popular place to see in Cornwall, a community hall opened at Indian Queens Pit in 2013. There’s a romance about Indian Queens… legend has it that it was given the name after Red Indian (now Native American) princess Pocahontas stayed there on her way from Falmouth to London. In the early 17th century, the local inn was called The Indian Queen. Indian Queens Pit is still at the heart of community events and open houses open air music and theatre events. There’s an annual fete held there too.